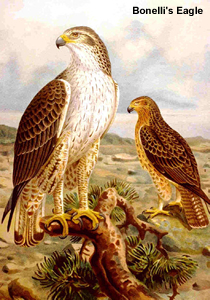 The Bonelli's Eagle (Aquila fasciatus) is a large bird of prey. . It breeds in southern Europe, Africa both north and south of the Sahara Desert and across southern Asia to Indonesia. 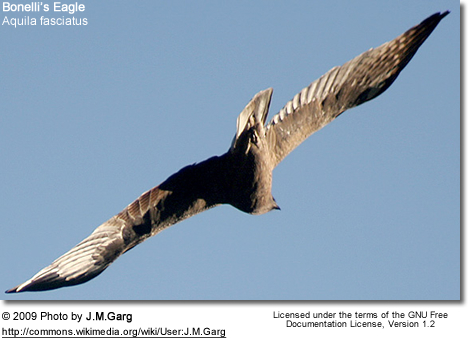 The Bonelli's Eagle is a species of wooded, often hilly, country with some open areas. The African race prefers savannah, forest edges, cultivation, and scrub, provided there are some large trees; this is not a species of very open or densely forested habitats. 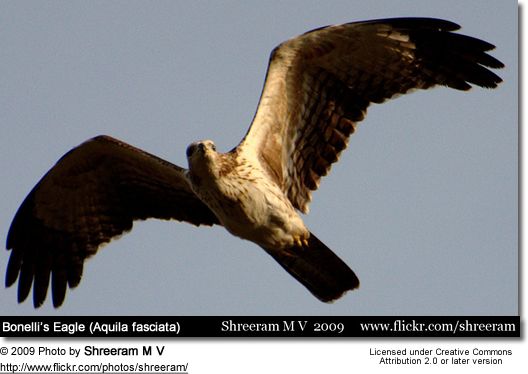 This is a small to medium - sized eagle at 55-65 cm in length. 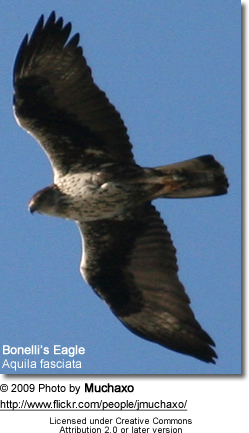 The upperparts are dark brown, and the underside is white with dark streaks. The wings are relatively short and rounded. The long tail is grey on top and white below and has a single broad black terminal band. The feet and eyes are yellow. Immature birds have deep buff underparts and underwing coverts, and have fine barring on the tail without the terminal band. It is usually a resident breeder which lays 1-3 eggs in a tree or crag nest. The Bonelli's Eagle takes a wide range of live prey, all taken alive. It usually hunts from cover by a quick dash from inside a tree, but it will also catch prey by quartering hill slopes like other eagles, or make a stoop from a soaring position. Most prey is taken on the ground. The Bonelli's Eagle is usually silent except in display and near the nest. Its fluted klu-kluklu-kluee call is less shrill than that of its near relatives.